Grindcore guitar god Takafumi Matsubara (Gridlink and Mortalized) has a new band now, Retortion Terror. They have recorded a split with an American grind band called Invidiosus. Both bands are currently seeking labels to print and distribute the release on CD, cassette, and LP. RETORTION TERROR–featuring legendary guitarist Takafumi Matsubara (GridLink, Mortalized Grindcore) and a mysterious lineup of international grinders–make their debut with 5 tracks of raw, blistering grindcore. In 2014, Takafumi suffered a brain infection that made it nearly impossible for him to play guitar, and many thought Gridlink’s “Longhena” might be Takafumi’s last record. Fortunately, he has beaten those odds; his recovery has been nothing short of miraculous, and he has resumed playing guitar and doing karate in spite of what the doctors told him. Retortion Terror pulls no punches on this split. Invidiosus–featuring current and former members of Amiensus, Rottenness, Violence Condoned, In Defence, Atrum Inritus–has spent the last 3 years relentlessly touring Mexico, Colombia, Argentina, Bolivia, and the U.S.A., and will now complete 2017 with a tour of Japan and South Korea (including a festival performance at Asakusa Deathfest). Seeking to always evolve and improve, Invidiosus has written and self-recorded 5 short grindcore tracks for their half of the split… be prepared for something completely different than you’ve heard from their past releases. This is by far the best representation yet of what Invidiosus can do with some free time, several hundred beers, and an infinite number of reasons to be pissed off at the human race. R.T. mix/master by Yacchung in Japan. Invid mix/master by Adam Tucker at Signaturetone Recording in Minnesota, USA. 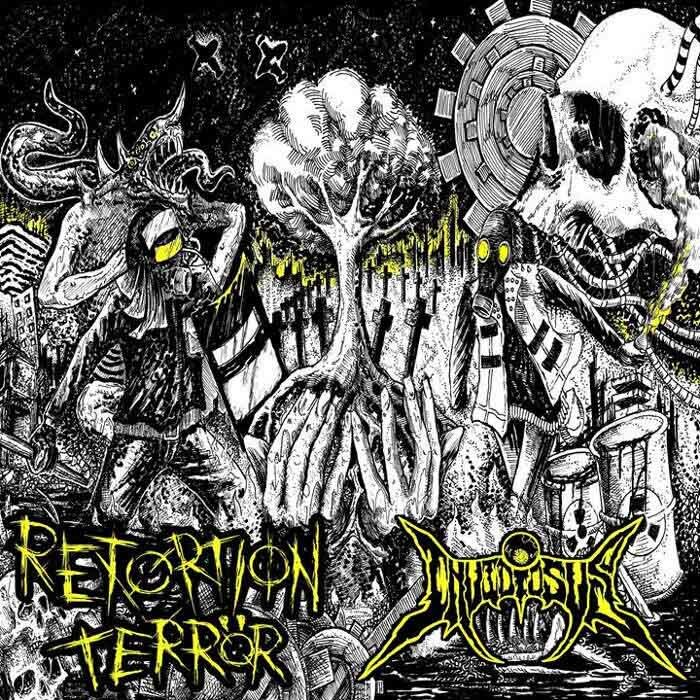 “RETORTION TERROR / INVIDIOSUS SPLIT” album artwork by Alfi Neizear in Bogor, Indonesia. They do not have malls where I live. one of the best posts ive seen in 1.5 years, lots of good band recommendations.